Steve O'Shea already holds a world record for rearing squid in a controlled environment. But everybody's got a dream, and O'Shea's is to do the same thing one day with the famously elusive giant squid. O'Shea is a research director at the Auckland University of Technology, but he's best known as a foremost authority on giant cephalopods. (For a good deal of background on O'Shea and his working methods, see David Grann's excellent New Yorker profile from 2004.) In 2000, O'Shea set a world record for deep-sea squid curation when he took a squid that normally lives almost a thousand feet below sea level and kept it alive in captivity for five months. A few days ago, O'Shea set out to capture a broad squid in the waters around New Zealand in the hopes of breaking that record. Broad squid, which O'Shea has raised in captivity before, are tricky due to their initially tiny size and a diet that evolves quickly over the first few weeks of life, but O'Shea believes it'll get him "one step closer to the end game" of raising a giant squid. I've been told in the past that what I'm trying to do is basically impossible, and I'm told that I'm just going to spend an eternity in trying to prove them wrong... We are proving that the impossible is possible. 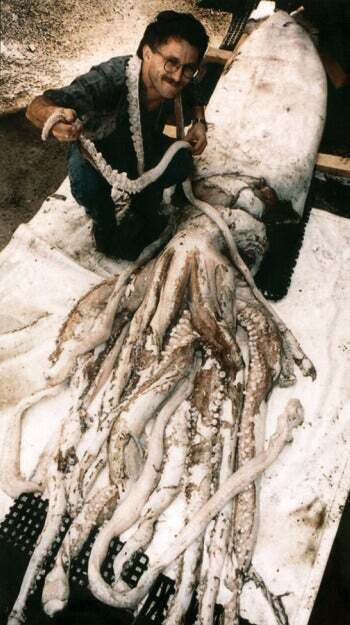 Pictured: Steve O'Shea in 1996, with a giant squid specimen.